Flooding in the basement of a house can be a nightmare. Beyond costly damage to the property, it can destroy any possessions stored there, and be a pain to deal with. Fortunately, this damage can be prevented with one simple tool: the sump pump. Unfortunately, most sump pumps only work while hooked into the houses electricity supply. A power outage during a storm could mean that the pump won’t do its job when it is needed most. This is where sump pumps with battery backups come into play. They will pump any water in your basement out even if the power is out, giving you peace of mind. Click the buttons above for detailed information about each unit, or read on for our review of each of the top 3 sump pumps with battery backup. 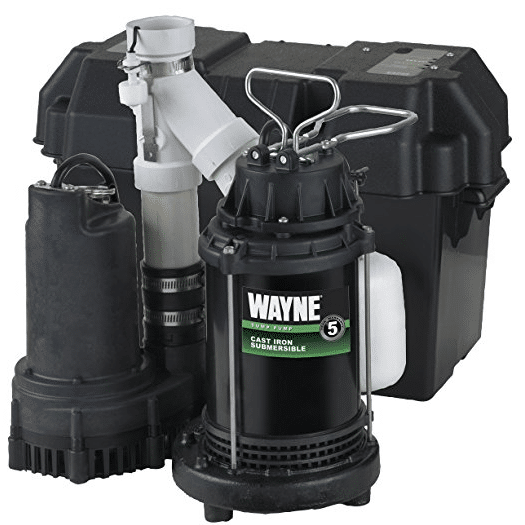 Our top choice for the best battery backup sump pump in this review is the WAYNE WSS30V. Between the excellent functionality, stellar reviews, and reliability, the Wayne pump out-shined the other sump pumps we looked at by far. 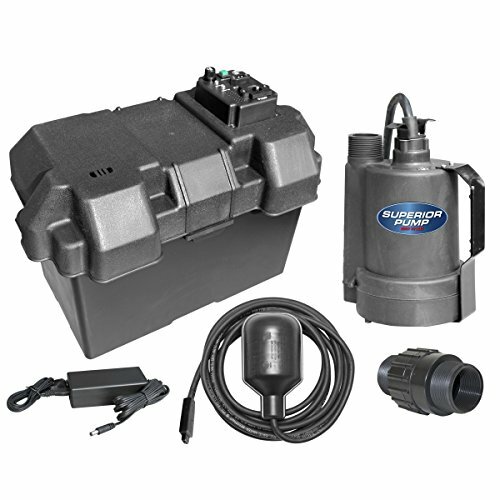 Read on to see why we think this is the best submersible sump pump we found. When it comes to sump pumps, the last thing you want is an unreliable product. If the pump stops working it could mean thousands of dollars worth of damage to your home. Fortunately, the Wayne WSS30V is an ultra-reliable option. Beyond having the legendary Wayne company behind the product, it has been rigorously tested and built with only the highest quality materials. These pumps have been tested to 1 million cycles, and the submersible is crafted from cast iron. This sump pump is one of the strongest units we reviewed, having the ability to pump up to 3300 gallons per hour on backup power, and up to 4200 gallons per hour on regular power. Now that is a lot of water! This beast of a machine is powered by a very capable 1/2 HP motor. Another reason we decided to choose the Wayne WSS30V for out top choice is it has been thoroughly field tested by customers, and almost universally liked. One Reviewer on Amazon said the “Powered pump worked flawlessly and was QUIET” and another said “You will be happy with this purchase!”. The Wayne WSS30V offers amazing functionality and reliability, and can be had at a very reasonable price. Quality is not something you want to skimp on when purchasing a sump pump, and the Wayne WSS30V is about the highest quality you can buy. High performance 12 volt back-up pumps up to 3300 GPH (gallons per hour), making it one of the highest performing DC pumps on the market. Our second choice in this roundup of sump pumps is the Superior Pump 92900. 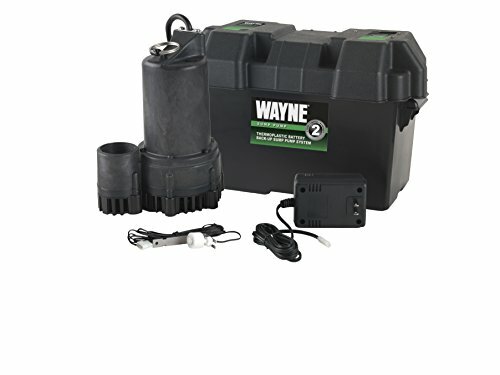 This product really impressed us by being able to pump a significant amount of water, while costing less than half of what the Wayne pump cost. This is not the highest quality sump pump on the market, but it will get the job done. The Superior Pump 92900 wasn’t intended to be a primary sump pump, but rather a backup in case of a power outage. Despite this, it is a quite powerful and capable unit. Surprisingly, it has a ton of features that aren’t usually seen at this price point. 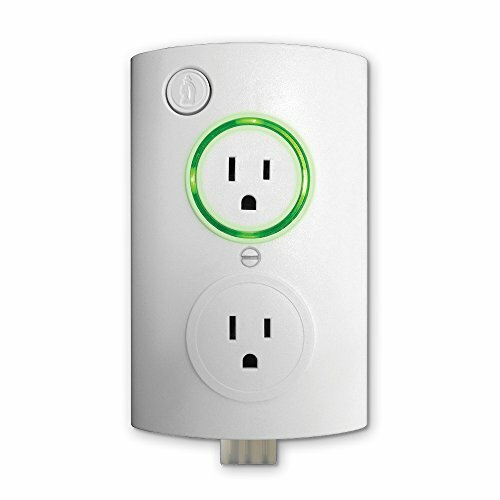 For example, it has an alarm function, as well as high quality thermoplastic construction. customers who have used the Superior Pump 92900 mostly had positive reviews for it, averaging 4.5 stars. One product tester stated: “Overall this is a good setup that seems like it will continue to work and give me peace of mind that I won’t flood my basement”. Although it is not the best backup sump pump on the market, the bottom dollar price and the great functionality makes the Superior Pump 92900 a great choice. 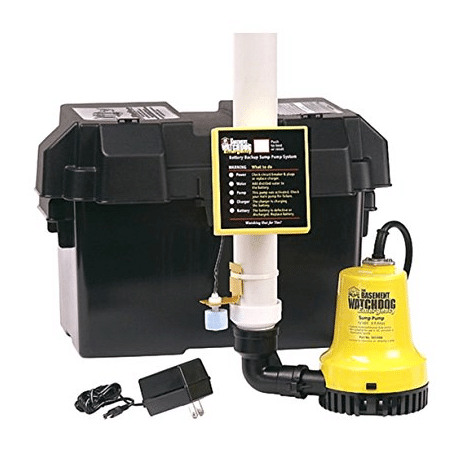 The last item in our review of the top battery backup sump pumps is the Basement Watchdog BWE 1000. The BWE 1000 is the lowest price pump in this list, although it is still a satisfactory product. We would recommend this unit to someone who does not have a very big budget. The BWE is able to pump a respectable 1,000 gallons per hour at 10 feet li., and an even better 2,000 gallons per hour at 0 feet li. Even at this low price point the BWE was able to pack in some neat features, including a controller, sensors to monitor battery liquid levels, and alarm system. The pump is able to run up to 6 hours continuously. While not the best reviewed pump on the market, it did please most product purchasers, averaging almost 4 stars. But a few reviewers did mention that they wished it had more pumping power. 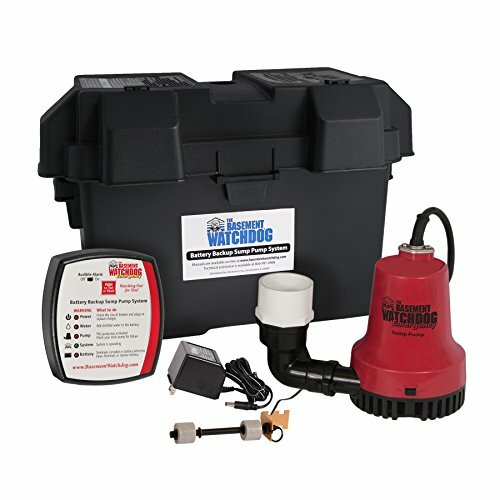 Overall, the Basement Watchdog BWE 1000 is a satisfactory product at an insanely low price. We think this product is worth buying if there is not enough money in the budget to purchase one of the other models we reviewed. Are you familiar with sump pumps, or are you sat there wondering what a sump pump is? Many people will be in the latter category. However, if you own a home and want to make sure it is running smoothly, draining water, and not costing you more than it needs to, learning about sump pumps and what they do is important. Put simply: a sump pump is a device that eliminates moisture and prevents flooding in a home. You will usually find them in a special pit below the main surface of a basement, and it collects any excess water from drains and pumps it away from the house. Because sump pumps aren’t something you’ll see in the house unless you’re looking for it, it’s easy to overlook them when you’re first looking at a house. You may not even know if you have one now. However, it’s important to know whether your home has a sump pump, as this will help you to be prepared in the event of an emergency, whether that’s a flood, melting snow, or another issue. Not all homes are likely or liable to flood, and this means that they may not need a sump pump. If a house does have a water problem, there may be a more suitable solution before turning to sump pumps. They aren’t always the go-to solution, but they can be effective for certain homes. So, with this in mind, let’s look at whether your house needs a sump pump and the information that can help you to select one. Whether your house needs a sump pump or not typically depends on your location. If you’re in an area that can be prone to heavy rain, then it’s a good idea to get a pump to protect your home from potential floods. Sump pumps are particularly helpful for those who live in low areas, like at the bottom of a hill. In these cases, water can pool and cause many problems, and a sump pump will stop this from happening. If you’re wondering whether your home needs a sump pump, it probably does. The American Society of Home Inspectors estimates that more than 60% of homeowners have some sort of moisture in their basement or crawl spaces. Some homeowners even like to invest in a second sump pump as a backup, just in case their first one stops working or becomes overwhelmed with water. This is a very smart move to make if you live in an area that is prone to rains and flooding. A house may also need a sump pump if prone to snow in the area, as snow melting can also cause issues with moisture. If you would rather not go through the hassle and expense of installing a second sump pump, you could save money by installing a water alarm and this will alert you of any malfunctions. Bear in mind that it doesn’t take a huge flood to cause a lot of damage – thousands of dollars worth. You may wish you had gone through the hassle of installing a second pump in the end. The way a sump pump works is pretty easy to understand. A hole is dug in the lowest part of your basement, which is where a sump pump sits and filters out water. As the pit fills up, the pump turns on and it moves the liquid out of the pit through pipes that run away from the foundation of your home into an area it can drain. A one-way valve (check valve) keeps water from entering back into the home. There isn’t any special wiring that powers the pump; just the household current. It’s a good idea to have some type of circuit interrupter to prevent electrocution just in case you are near or in water. Most residential sump pumps will turn on automatically from a pressure sensor or float activator. The pressure sensor activates as it senses the water building up and creates more pressure than air. The float activator has a ball that floats on top of the water, which moves the arm as the water level rises. Think of it as similar to how your toilet tank works. The impeller (a fan-like device) will turn on next. It will spin and force water towards the side of the pipe, which creates a low pressure centre that water will rush to and get pushed through the pipe as a result. All of these things happen quickly and work in harmony so that your home stays dry. That being said, as there are lots of parts working together, if one thing stops working, or something disrupts the way it is working, things can go awry quickly. This is why a second sump pump may be required in high risk areas. Power cut – A backup generator that can be manually activated is the only way to combat this. If your primary pump mechanically fails, a generator cannot help. Parts of your pump may malfunction during power surges. Wrong size pump – a small pump can be just as effective as a big one, so the size does not matter in this instance. You need to make sure you purchase the right size pump. Pump not installed properly – if you get the right pump but don’t install it correctly, you will experience problems. Problems with the switch – one of the biggest mechanical problems when it comes to sump pumps is the switch failing. Lack of maintenance – you must maintain your pump as the manufacturer recommends, which we will discuss later. Defective pump – if you have purchased a defective pump you will not get the required effect if you have a moisture issue. How Should You Maintain Your Sump Pump, And How Often? Some pump manufacturers recommend the pump to be run every 2-3 months in terms of maintenance. Some recommend a yearly program completed just before the rain season hits. At the very least, you should follow the maintenance tips below at least once a year. Some experts will even recommend that you do this every 2 months, but that may feel like overkill. Quarterly maintenance is probably a decent goal to aim for. It takes just a few minutes and can avoid some serious issues and expenses in the future. If you have a serious problem, don’t try to fix it yourself. Make sure you call in a pro. Clean all vents and air holes for maximum effectiveness. What Different Type of Sump Pumps Are There And What Should You Look For? In visual terms, the biggest difference in sump pumps is whether the motor is suspended above the pit, or placed inside of the pit. Submerged sump pumps are more aesthetically pleasing because the pump isn’t seen hovering above the pit. However, the drawback is when it comes to maintenance and repair. A sump pump like this is difficult to reach, so it’s harder to work on. Many repairs will require a removal of the sump pump which will take even more time. For manual pumps, all they wait for you to do is turn them on. For an automatic pump, take note of how the pump is triggered. Both float valves and pressure switches are triggered by water depth. As the water depth increases, the pressure on the switch increases until the switch is tripped. Float valves just float on the surface of the water, and once the valve gets to a certain height, the pump kicks in. One important difference: the pressure switches are usually enclosed and can’t be adjusted, but also are not affected by junk or small trash, unlike float valves. This is important to bear in mind when shopping for your sump pump. 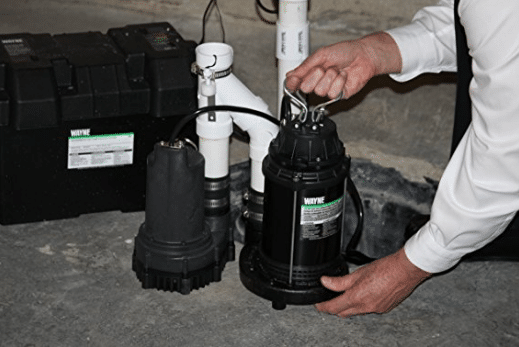 What Should You Look For When Purchasing Sump Pumps? Head pressure is another factor to consider when purchasing the right pump for you. This is a rating that tells you how high a pump is capable of pushing water. You can measure the height of the pipe from the base of the sump basin, and you can make sure that height (which is exactly how high your pump is going to pushing water) isn’t more than 80% of your pumps rated head pressure. Doing this will ensure that your pump operates as it should, and doesn’t burn itself out while in use. Horsepower is something you should think about before purchasing your pump, too. This basically does two things: It moves the water out faster, and it uses more electricity. So there is a bit of trade-off to be considered before you make up your mind. What is more important to you? If your sump pit fills up rapidly and you have a definite water problem then it’s obvious a higher horsepower pump is needed for your home. Alternatively, you may need to increase the size of your sump pit so that your pump doesn’t have to run as often. The last thing you should be thinking about when buying your sump pump is this: how is it powered? Battery backups and main line back ups are a few of your options, and some homeowners decide to have both. We can’t really tell you how long to expect your sump pump to last, as there is no definitive life span. Yours can last anywhere from 3-20 years. That’s a big window, so things can get pretty confusing. The US Department of Housing and Development estimates the average life expectancy at 10 years. Anywhere from 10-15 years should be what is expected of your sump pump if you’re putting it through regular maintenance. However, some people say theirs only lasts 5-7 years. It really does depend on the home, usage, and the maintenance routine performed. Acidity and dirtiness of the area you live in will play a part too. If you want your sump pump to last for 10-15 years, then you have to commit to regular maintenance. As well as performing your own maintenance as outlined here, it could be a good idea to have a technician come out and look at your equipment every year. Pumps that run frequently because of a high water table, water drainage, or weather conditions should be looked at more often – perhaps every 6 months. Sump pumps are mechanical devices, so they can fail if they aren’t maintained correctly, which will lead to a flooded basement and costly repairs. You will end up wishing that you had adhered to the maintenance routine. Sump pumps may seem confusing at first, but they are actually pretty straightforward. Now, you should know what size your sump pump should be, what to look for in your sump pump, how long it will last, how to maintain it, and more. Thanks for reading!